Ohh!...Ahh! The Modularean Eco House dollhouse is a very cool example of a simple modern dollhouse with clean lines and delicious sliding Plexi panels. This was a custom project designed by David Baker of David Baker + Partners Architects based in San Francisco. It was built by woodworker Julianna Sassaman. 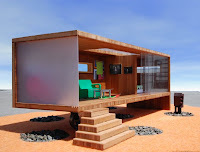 Per the firm's site: "Both playful artpiece and artful playpiece, the Modularean Eco House is a sturdy, sustainable custom dollhouse". For collectors looking to purchase, I have inquired about the cost of such a great piece of work. As soon as I hear back from David, I will post. Contact me as soon as you hear from them. I'd like to get one for my daughter--depending on the price.